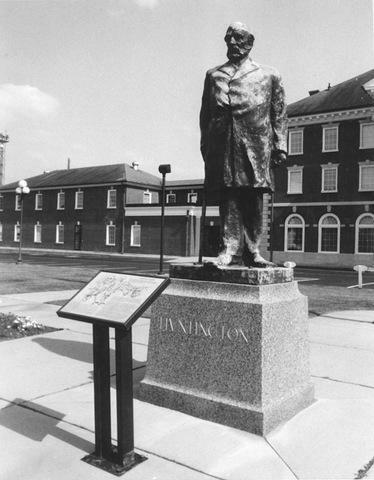 A statue of Collis P. Huntington. On February 27, 1871, the West Virginia Legislature incorporated the city of Huntington. It came into existence quite unlike any other community in the state. It was named for Collis P. Huntington, who, in the early 1870s, was extending the Chesapeake & Ohio Railway from the Atlantic Coast to the Ohio River. For the western terminus of his railroad, he selected a plot of Ohio River farmland that was best known for a small teachers’ school known as Marshall. Huntington’s brother-in-law purchased 51 farms in the area, totaling 5,000 acres. An engineer from Boston laid out a geometric gridwork of intersecting avenues and streets. In this sense, it was the most planned city in West Virginia history. Huntington quickly became an important railroad and manufacturing center as well as a gateway to the southern coalfields. In less than 20 years, Huntington’s population had topped the 10,000 mark, making it West Virginia’s second largest city—behind Wheeling. By the mid-1920s, it had grown into the state’s largest urban area. Today, Huntington, which boasts the largest inland port in the country, is again the state’s second largest city.